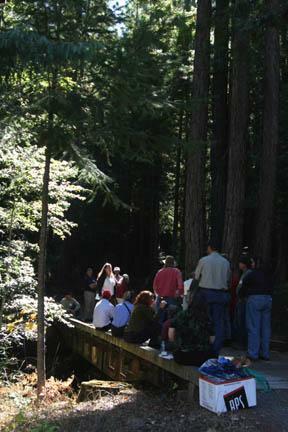 Forest stewardship workshops in Marin and Sonoma County are designed to give the small property owner the tools and resources needed to cost-effectively manage their forest parcels in an ecologically sound and fire safe manner. These workshops are generally driven by information needs of local property owners, so no two workshops are ever quite the same, as people in different regions will necessarily be faced with different challenges. The focus of these workshops is to provide a common understanding of the various ecological, management, cost, and safety considerations that owners and managers need to balance when making decisions, and to find common goals for neighboring property owners. If neighbors can both work together toward a common goal and can come up with projects on a sufficiently large scale, it is possible to qualify for state and/or federal assistance. For current news and information, read the Forestland Steward Newsletter. Sierra Cantor discusses some of the factors affecting water quality in the Mark West Springs area. "How to Grow California Oaks"